A compilation book between noted author Joe Cummings, who lives in Chiang Mai, and prolific photographer Luca Invernizzi Tettoni. 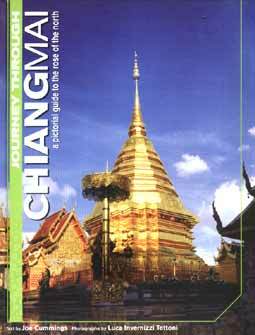 Journey Through Chiang Mai (ISBN 981-261-063-4, published by Marshall Cavendish, 2005) is a slim hard-cover travelogue mainly of Chiang Mai City, though the surrounding regions are included. The contents cover the history, people and lifestyle, the economy, leisure, festivals and holidays, city highlights, food and then maps, with each section having good colour plates, some full-bleed double page spreads, as well as interesting text to explain the images. Cummings asserts that, “Chiang Mai has perhaps the most unique sense of identity of any city in Thailand. A capital born in pride for things northern Thai, it’s a city that continues to hold fast to its khon meuang (people of the principality) way.” Anyone who has spent even a short time in the North would have to agree. The northerners are different, and the book does go part of the way to show “why”. In the economy section, Cummings notes when the agrarian economy eventually was overtaken by the sale of locally produced items and tourism. “By the mid-1960’s tourism had replaced commercial trade as Chiang Mai’s number one source of outside revenue, a ranking that has been maintained since. Close second is the manufacturing and sale of local handicrafts.” However, the Cummings is also brave enough to admit, “Still the north continues to serve as a major conduit for illicit narcotics from neighboring Myanmar and Laos, with the largest and most significant commodity being yaa baa, crude amphetamine pills manufactured by the millions along the border. This underground drug economy may in fact exceed legal transactions in the north.” This statement will not make him much friends in a region where the government sponsored ‘drug wars’ have been proclaimed great successes. In the food section, the northern khan tok dinner is explained. (The khan is the table, and the lidded bowls are the tok, if you did not know.) The food section was, for me at least, one of the more interesting sections, with brief snippets on Chiang Mai sausages, khao soi, mushrooms and chilli dips. Unfortunately, it does not recommend many restaurants, which again I think is unfortunate. At B. 625, it is another option in the travelogue collection. Being hard-cover and well bound does mean that it should last longer than most travel books. It is not, however, a travellers’ guide, like a Lonely Planet, but more of a resource. It is also up to date, with many of the newer additions to Chiang Mai getting a mention, such as The Writer’s Club and the Guitar Man restaurant. Whilst there are a couple of pages of (simplified) maps, there is no index, which is a serious omission in my mind, particularly as there are more photographs than text. This book is but one in a series, which includes Bangkok, Colombo, Hanoi, Phnom Penh, Singapore and Sydney amongst the titles, but my local Bookazine store only had the Thailand ones. The Bangkok publication is in similar vein, with words and pictures, and also does not have an index! Now here was the first problem as Jack Bruce and Ginger Baker had already played together in ‘The Graham Bond Organization’ and had hated each other so much that during one physical fight Ginger Baker had actually tried to stab Jack Bruce with a knife. But Eric Clapton wanted Jack Bruce and would not budge without him so bridges had to be built. Even though they never got along personally, musically as a rhythm section Bruce and Baker were a match made in rock ‘n’ roll dreams. Add to that Bruce’s stunning voice and harmonica work, you have the perfect foil for Eric Clapton’s mercurial guitar histrionics. When they started out the idea was to be a blues trio to play small clubs like Buddy Guy with a decent rhythm section. But in 1966 the whole world was turned on its head with ‘Psychedelic’s, Hendrix’, ‘Sergeant Pepper’s’, etc. Baker, Clapton, and Bruce, calling their trio ‘Cream’ naturally rose to the top. They only actually lasted for twenty eight months from July 1966 until November 1968 when they walked off stage at the Albert Hall for the last of their farewell tour gigs, after which three of them did not share the same room for 35 years. But during those short sweet months they achieved so much. They had three hit albums: ‘Fresh Cream’ (1966), ‘Disraeli Gears’ (1967) and ‘Wheels Of Fire’ (1968) a double album, half live, half studio, which went number one all over the world. This astonished their record company Atlantic so much (that they had a band that could sell over two million dollars worth of product with one album), they invented the Platinum album as a tribute to them. Their final tour of the United States of America grossed over 540,000 dollars in six weeks, and it is not surprising a lot of company executives cried when they split up. You must put in context how much a million dollars was in 1968 to get a real grip on how huge ‘Cream’ was at the time. In the three years after the band had finished, Atlantic put out four more albums. The contractually binding ‘Goodbye Cream’ (1969) which included three live tracks and three studio cuts; ‘Badge’ being one studio track co-written between Eric Clapton and George Harrison never played live by the band until this reunion. ‘Badge’ is probably one of the songs ‘Cream’ were later best known for. 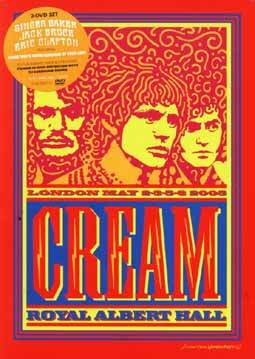 ‘Best Of Cream’ (1969), which was followed by ‘Live Cream’ (1970) and finally ‘Live Cream Volume Two’ (1972). These were all top ten hit albums worldwide. There have of course been hundreds of compilation and exploitation albums since. In 2004 Eric Clapton mooted the idea to Baker and Bruce about a possible reunion. Both at first were resistant to the idea, but arms were twisted, and eventually a meeting was arranged. Time had, as is often the case, healed old wounds, and it was decided to hire a rehearsal studio just to see! It went well. The Albert Hall was booked for four nights in early May 2005 (The tickets sold out in minutes, and swapped hands for thousands on e-bay). The risks were musically staggering, time has moved on so much (we are talking thirty seven years here), would a power trio be able to cut the mustard in today’s age of technology, backing tapes, click tracks, etc? Would Ginger Baker kill Jack Bruce during rehearsals, or vice versa? Could Eric Clapton still put the hammer down on the electric guitar as of days of yore? Actually, the only problem was an attack of nerves by the normally nerveless Baker who wanted to pull out two days before the first concert, but was talked round by Clapton. To top it all this was a band that was volatility itself, one night the best in the world, but on another day ... Oh dear. What if the first night was not all it should be! Would any of them turn up for the next night? This DVD is positive proof that nothing like that happened. They saunter on stage for opening number ‘I’m So Glad’ on the first night, and the old magic bounces between the three musicians. All four nights were recorded; afterwards the band watched the tapes and decided which was the best version of each song and put it out as a complete concert in its correct running order. (If they could not make up their minds which night was better, they simply tacked it on as a bonus track to the DVD.) You know which night each song was taken from as a little sign pops up at the beginning of each song to let you know. All of the great ‘Cream ‘songs are here, including the never before played ‘Badge’ and the wonderful Ginger Baker sung ‘Pressed Rat and Warthog’, both from ‘Goodbye Cream’. There is even a version of Ginger Baker’s drum solo number ‘Toad’, which may have been cut from its seventies length twenty minutes, but at over seven minutes still shows that Ginger Baker is not ready to pass on his greatest jazz/rock drummer title yet. Jack Bruce’s vocals and Harmonica playing are better than they ever were, whilst his bass playing remains as inspirational as ever. Can Eric Clapton still give every rock guitarist in the world a run for their money? After only one song there is only one answer: a huge big yes. All of the playing is simply better than you could possibly wish for.